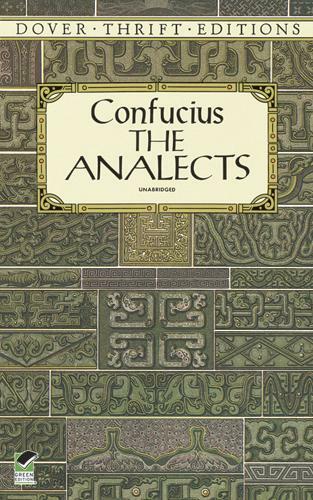 In this excellent English translation of The Analects, or Sayings, of Confucius, readers will find a rich distillation of the timeless precepts of one of history's most influential teachers and social theorists. A Chinese philosopher who lived c. 551 to c. 479 B.C., Confucius originated and taught an ethical, socially oriented philosophy that stressed proper behavior and a sympathetic, mutually supportive attitude among individuals, their families and society. From his teachings came a system of ethics for managing society that has influenced generations of politicians, social reformers, and religious thinkers. Indeed, the effect of Confucian philosophy has been so profound that it has become basic not only to an understanding of traditional Chinese civilization, but of Western society as well. Now the essence of Confucian teaching, contained in The Analects, is available in this inexpensive volume, providing inspirational and instructive reading to anyone interested in the history of social thought, Chinese philosophy, or theories of ethical behavior.